Mogadishu (AFP) - Somali government and African forces battled a powerful warlord in Mogadishu Friday, with security forces then storming a major radio station critical of the fighting and arresting journalists. Witnesses reported at least five dead in a gun battle lasting several hours, after the army backed by African Union (AU) troops launched a pre-dawn assault on the base of warlord Ahmed Dai in a bid to disarm his militia. There were bursts of intense gunfire and heavy explosions with rocket-propelled grenades fired by both sides, witnesses said, reporting at least five dead. 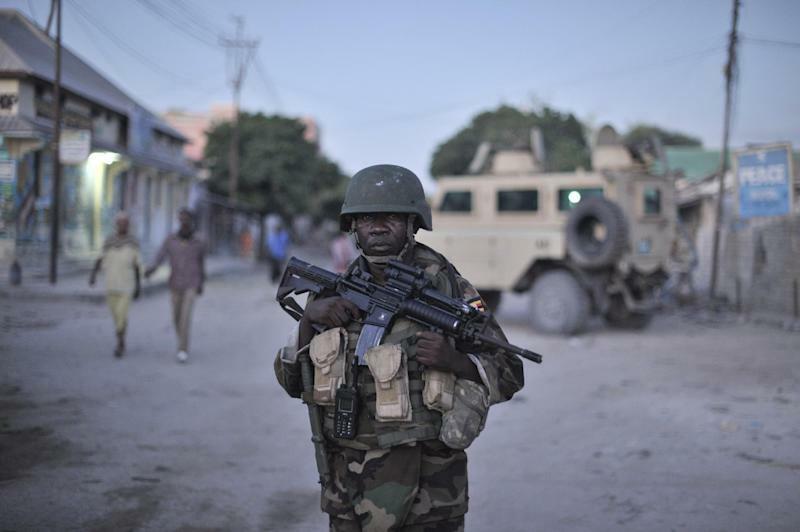 "Fighting was very heavy, both sides used heavy machine guns and fired grenades," said Abidiweli Mohamed, a local resident, adding he had seen five dead bodies, including three civilians. But Dai escaped the attack and is reported to be on the run. After fighting calmed, security forces turned to one of Mogadishu's main radio stations, Radio Shabelle, arresting 20 staff and seizing equipment, with a security official accusing it of "negative" broadcasts about military operations. "They have arrested 20 members of staff, including the director, and equipment was also seized," said Mohammed Bashir, a producer at the station. "I escaped only because I had gone to pray," Bashir added. Somalia's government launched a campaign to disarm militias earlier this month, with troops backed by the AU mission in Somalia (AMISOM). AU troops on Friday displayed rockets and machine guns they had seized from the raid, despite militia commander Dai insisted the only guns he had were a "few for self-defence". AMISOM said in a statement that it had launched the raid "following a tip-off that there was an arms cache", and arrested 20 gunmen. Fighting took place in a neighbourhood close to the heavily defended airport zone, headquarters of the 22,000-strong AU force. War-torn Somalia is awash with guns after more than two decades of conflict, with several politicians and local leaders commanding what are effectively private armies. Such forces are not connected to Somalia's hardline Shebab Islamists, who are fighting to topple the internationally backed government. The clashes come just two days after UN Security Council envoys briefly visited a fortified zone within the dangerous capital, where they promised to support the first elections in decades, scheduled for 2016. The fighting comes as warnings grow of a humanitarian crisis in Somalia, three years after more than 250,000 people, half of them children, died in a famine. UN aid chief for Somalia Philippe Lazzarini told UN envoys on Wednesday that "all the signs that we saw in the pre-famine period in 2010 are here". Lazzarini said the country is "at a critical crossroads" in an appeal for more aid, saying it would be "morally intolerable for the world to let Somalia go into crisis only a few years after the devastating famine". A million people have fled their homes inside the country, and more than a million live in neighbouring nations as refugees.